Sat, Nov 10, 2018, 01:01 am SL Time, ColomboPage News Desk, Sri Lanka. 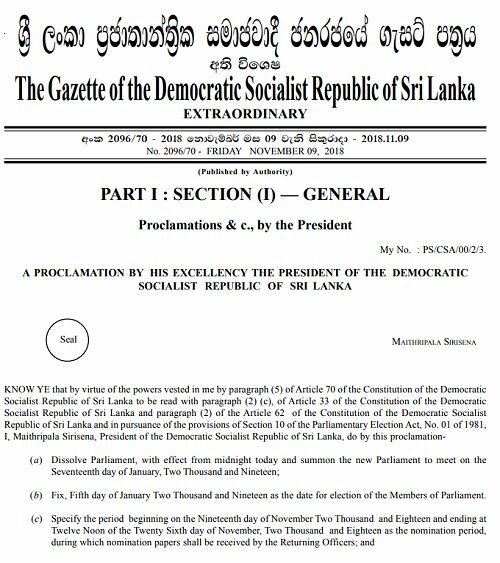 Nov 09, Colombo: Deepening the political crisis he created two weeks ago, Sri Lanka President Maithripala Sirisena in an extraordinary Gazette notification announced the dissolution of the parliament with effect from Midnight Friday and scheduled general elections to be held on 5th January 2019. Nominations will be called from 19th November 2018 till 12 noon 26th November 2018 during which nomination papers shall be received by the Returning Officers of the respective districts. The new Parliament will meet on 17 January 2019. The political crisis was started when he unconstitutionally ousted the Prime Minister, Ranil Wickremesinghe on October 26 and appointed former president Mahinda Rajapaksa as the Prime Minister of the United People's Freedom Alliance (UPFA) government. When Wickremesinghe refused to leave the post and demanded a vote in parliament to prove that he has a majority support in the House, the President prorogued the legislature until November 16 to allow the new Prime Minister to lure the MPs to his side with cabinet posts. Under pressure from the local as well as international organizations including the United Nations, European Union and Western governments, the President decided to reconvene the parliament on November 14, just two days ahead of the scheduled date. However, earlier Friday, Keheliya Rambukwella spokesperson for the United People's Freedom Alliance (UPFA) -led de facto government acknowledged that the party remained short of the 113 MPs needed to prove majority in the 225-member parliament. "At the moment we have 105 to 106 MPs," he told reporters. The dissolution of parliament after failing to secure enough support from opposition parties clears the way for a snap election nearly two years ahead of schedule. The former Prime Minister-led United National Party (UNP) says the dissolution of Parliament by the President Maithripala Sirisena today nearly two years before its term expires is illegal and against the constitution. Under the 19th Amendment, which has amended the Article 70 of the Constitution say the "(1) The President may by Proclamation, summon, prorogue and dissolve Parliament: Provided that the President shall not dissolve Parliament until the expiration of a period of not less than four years and six months from the date appointed for its first meeting, unless Parliament requests the President to do so by a resolution passed by not less than two-thirds of the whole number of Members (including those not present), voting in its favour.."
However, the Extraordinary Gazette Notification issued by the President says he dissolved the parliament "by virtue of the powers vested in me by paragraph (5) of Article 70 of the Constitution of the Democratic Socialist Republic of Sri Lanka to be read with paragraph (2) (c), of Article 33 of the Constitution of the Democratic Socialist Republic of Sri Lanka and paragraph (2) of the Article 62 of the Constitution of the Democratic Socialist Republic of Sri Lanka and in pursuance of the provisions of Section 10 of the Parliamentary Election Act, No. 01 of 1981."